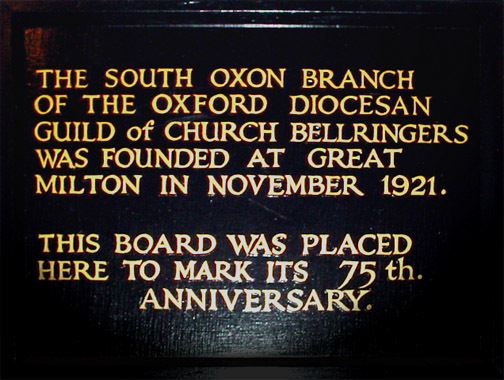 The Oxford Diocesan Guild of Church Bellringers South Oxon Branch was formed at Great Milton in November 1921, and is one of 15 Branches comprising the Oxford Diocesan Guild. It is bounded to the north by the Aylesbury Vale, to the east by the Chiltern Hills and to the west and south by the Rivers Thame and Thames respectively. South Oxon Branch has 20 towers and is mainly rural with only two towns Watlington and the market town of Thame. The remainder are village churches including the Abbey Church at Dorchester. Click the Tower List Navigation button, or the map to view details of a tower. We hope you find the information included to be of help.